I have the day off today because it's Good Friday. I remember last year when I was in the interview process and they said, "You won't be able to reach us on Friday because we have the Good Friday holiday off" and I was all woo-hoo! Hope I get to work there! I've never worked anywhere that you got Good Friday off. Not even when I worked at a church. I have already started a load of laundry and have begun putting dishes away. I also plan to cut more of that ridiculous monkey grass and to wash the floors. You can see I have a fun-packed day planned for my bad self. 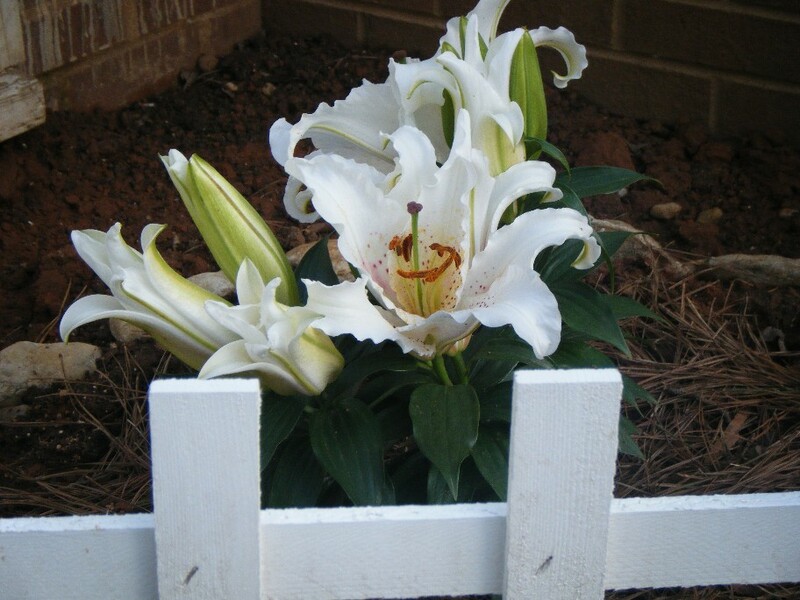 When our cat Ruby died a few weeks ago, we buried her in the back yard and planted a day lily on her grave site, and today her lilies bloomed, just in time for Easter. So pretty! Who loves her some neighbor Peg? There's a little note pad, and some spray from Bath and Body works, plus chocolate that is mostly gone already, as you can imagine. See our two holidays peacefully coexisting on the counter, along with the corkscrew? Isn't it a beautiful thing? He looks like a vulture. I like Winston's expression. Winston, who has never gotten that riled up about anything in his life, finds Francis a constant mystery. We all do, really. Speaking of cats, I thought maybe I'd mosey on down to the shelter today and just seeeeeeeee who was down there needing a home. Maybe. Because we're out of cats. This measly two-cat household is sorely lacking. Is all I'm saying. So that look up on Francis' face, above? Yeah. Get used to it. Maybe. Next Post Did she or didn’t she? Only her animal shelter knows for sure. Peeps explode when they are microwaved. I think you should save the name Lily for your next dog…imagine calling out the back door “Lulu, Lily, dinner time!”, it just has a nice ring to it. And doesn’t that old saying go something like, “you can call a cat whatever you want, it’s still not going to come”? I did my research and it only takes six minutes to make Peeps now. When they were first made it took 27 hours to hand make them. That must be what I remembered about how long it takes to make one. BTW, they only have 32 calories per Peep. Good, I’ll have another one. Oh, poor Fran if a new kitty enters the house. My husband rescued a tiny kitten that was about dead. My two old cats about had heart attacks. I never heard such hissing and growling in my life. They never got over it, but I found a sweet young mom that took that baby and raised him. Another cat would be better than another dog. Dogs are too high maintenance. Easter Lily would be a great name for the new kitty in honor of your beloved Ruby. I love those Peeps. I read the other day it takes a long time to make ONE of those Peeps. I was shocked at the amount of time. I’m going to have to research the time before I make a statement. Four cats. That’s the optimum level. And a dog. If the population dips lower around here I can’t settle until we’re brought back up to strength. Enjoy your floor-washing. It’s typically rubbish Easter rainy weather here so I can legitimately refuse to clean the kitchen floor on the grounds that it will be covered in muddy pawprints again within 3.6 seconds. Have a nice chocolately weekend! 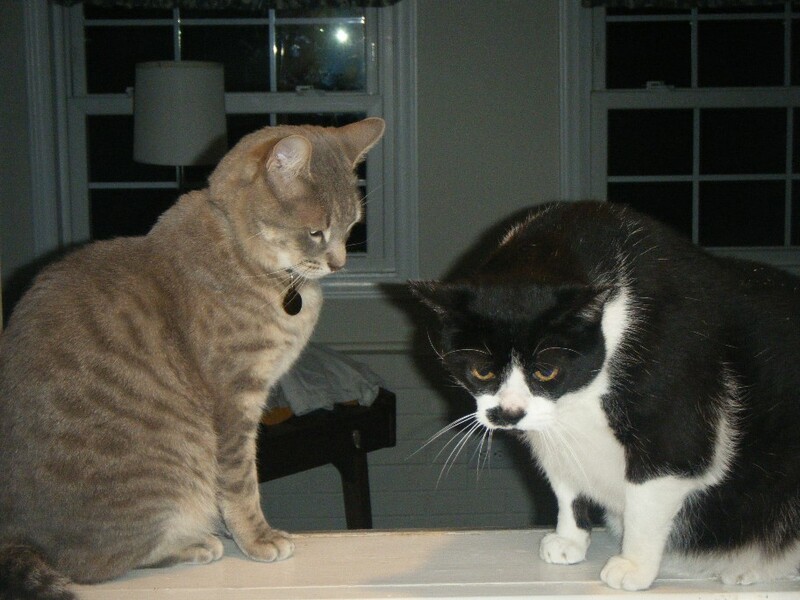 If we were to ever get your Mr. Grumpy Pants Francis together with my Sweet and Charming Lester Buster they could totally take over the http://www.catsthatlooklikehitler.com website. I suspect those 2 boy felines of yours need a new female to boss them around and make them toe the line. Interesting how I am the ONLY one who noticed that your nice neighbor brought you some Peeps. I do love the Peeps! It’s not Passover without the fake fruit-slice thingies. my son brought me a basket today and it’s full of dirty laundry. your basket is better than mine! I take it that Tallulah is impervious? oblivious? to the Vulture Stare of Death? All I got from my neighbor today was a cardboard box his window came in. YES, my kids love it. YES, they’ll use it for hours of entertainment. But really… it’s got nothin’ for me. I wanted chocolate. I hope you got a kitty!! Have you considered an Easter chick? Just yesterday I was thinking to myself (HA!) that we should be hearing about a new cat pretty soon… and then I peed on myself laughing reading KW’s embarrassing story. That spray looks like Japanese Cherry Blossom. Yummy. The day lilies are gorgeous, and Francis is downright scary. I understand though, I get fed up with dogs too. I think Lazarus is a great name for the Easter kitten. Or maybe BunnyFace. Or Cottontail. Or Tomb. Or Peep(s). Or Cadbury. I like how we have all assumed there WILL be an Easter kitten. Wait, another kitty but not another puppy? What kind of discrimination is this? Do you want Talulah to go all Rosa Parks on you? I can’t even walk into shelters anymore without crying, those lost scared souls looking at me so hopefully. Good luck finding your new kitty. Junie. This is too weird. I have the EXACT same corkscrew lady, but mine sports a yellow dress and not a blue one! So odd that we would end up with the same one!! Also, as you are well aware, my household is also dual religion and I hosted the Seder on Wednesday night. With the hard-boiled eggs and I made the hirosses (sp?) even! We gots the menorrah right next to the Christmas tree in December, too! Shall we let the secret out that Jewish men make THE BEST husbands? Anything can coexist happily with a corksrew! Ooh, Francis looks so menacing! And, YAY! for another kitty! So many kitties each spring, so few good homes! Go for it! Since you have the day off, are you doing ask June? Because I have a raging proofreading debate that you could settle. Please? I will post in the ask June section my sentence in question. Happy Easter June. 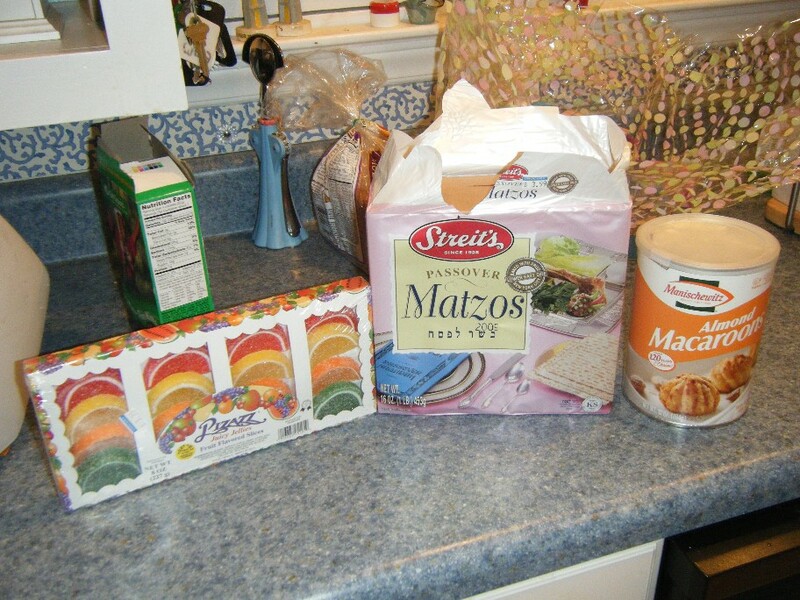 I am a Christian who adores Jewish passover food. I would be lovin life at your house. Go and get yourself a kitty. You deserve a treat! I know that cat growl all too well. We’ve added a few cats to our household over the years. We’ve had up to 4 at one time. Right now we have 2, and that’s probably all we’ll have, since adding a dog into the mix is quite plenty. Good luck on your kitty search. But our oldest cat, Farley, is SO neurotic and hisses at everything! We have the two cats next door who visit and he goes crazy batting at them through the windows and growling. His brother cat Larry is like Winston, unfazed by it all. So I think we will have to wait until Farley goes to that great litterbox in the sky before we can add to the group. Yay! New kitty! The shelters are PACKED with displaced souls in need of some good loving. So many “forclosure pets” these days! It’s wonderful that one of them may find such a terrific home. Oh, and you can name the kitty Lily. Squee! So excited! I will be on tenterhooks until you let us know! : D an Easter kitty!! Get one. Or more. I will not mention how bitter I may or may not be about not getting Good Friday off. 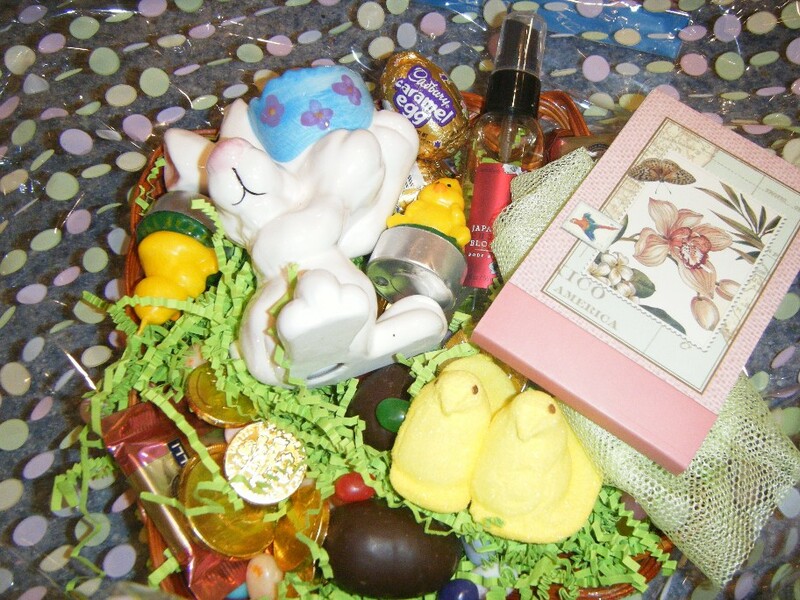 And that is a delightful Easter basket. What a great neighbor.